Therefore, for teachers, even if you have not seen it before, the concepts are likely to be far more recognisable to you from your experience with students in your class than things like conversations about Broca’s area, and the French physician’s theories regarding speech and hearing. We can see by the nodding heads of thousands of teachers that the basic assumptions of the model are correct or very close to correct. When we superimpose the analysis of the brain scan data onto the divisions of the Learning Pyramid, we see that one strongly supports the other. Brain scans show that listening memory is one of the smallest and therefore weakest memory centres in the brain. This supports the information in the Learning Pyramid. I remember your face, just not your name. This is important because when we look at the next level of the model, we find visual memory gives us much better results than audio memory. Does that match with what we find with the structure of the brain? You bet it does. The visual centre is much larger and therefore stronger than the auditory centre. In regards to learning, the ability to see the instructor can be as important as seeing the actual physical process, because when we watch someone we interpret huge amounts of added information. For example, a chemistry teacher demonstrates mixing chemicals. Even if the chemicals are completely inert and even if the teacher does not say a single word about the danger of mixing chemicals, the message of the white coat and goggles is caution. The next level in the Learning Pyramid includes the student becoming active in discussing the items learned. When discussion is involved, there has to be speaking engaging Broca’s area of the brain and thought engaging frontal lobes are engaged all going through the central processor of memory. Therefore the amount of the physical brain involved is greater as well as the number of places in the brain that is engaged, causing the interconnections from centre to centre to be heightened. Do ‘heightened’ interconnections in the brain make a difference? You tell me. I know personally the best way to get through a tough subject in college was to join a study group. The fact that practice (repetition) works is not a surprise, but why and how to best use it are good questions for the busy teacher. We know it’s easier to remember information that is attached to something we already know. It would be nice if all of the information our students needed to memorise was based on something familiar. But, that will never happen! So as teachers we have to find a way to cause repetition in a way that will engage the student enough to create the memory you need them to have. All of your students can remember the information, if they want to. For example, a rap song may have a rather long story line with little repetition, yet many high school students know all the words. The very same students who remember many rap songs cannot seem to remember a simple three line haiku poem. The experts will tell us it’s because the rap song triggers implicit reflexive information about the student’s daily life. They have repeatedly listened to the song to get each and every word. Effectively, they have worked hard at practising to be perfect. This points out that the greatest barrier to memory is not capacity or content. It is not novel or unique information versus very familiar information. The greatest barrier to memory is interest and engagement. The trick is to keep the student engaged without letting him/her get to a place of boredom and active disinterest. That is, teach without allowing your students to switch off. Good News, ABBLAT methodology does just that. The biggest problem for continued practice is boredom from rote application. Who wants to do rote memorisation? Do you? I certainly don’t, not even when I am interested in the results. Teaching goes beyond memory and learning as it requires the explanation of what was learned so that the listener understands the teacher. To learn something does not require it to be remembered. And, conversely, to memorise something does not require it to be learned. We learn something only to forget it a few days later. We see students memorise a list of facts without the foggiest idea of what those facts mean. However, to teach something requires both memory of the data and learning of what it means or how it happens. If a student can rephrase a statement, concept, or process given by the teacher, such that another student can understand it, the teaching student is far more likely to know that information at a later date. Logically it follows that one must know an item well in order to explain it to another. The better it is known and understood, the better it can be taught. Then of course the process of teaching requires the “teacher” to clarify his or her thoughts in order to state them clearly. Gaining clarity requires decisions on what is the correct concept or process and decisions on what will be said and what will be omitted. So far we have been looking at the different individual types of learning. Next is a look how those types fit into two main categories. Passive and Active (or participatory) learning and teaching. Passive learning is when the student is receiving the information from the teacher. The student is not required to do any activity other than pay attention (possibly take notes) and learn. Participatory learning is when the student is required to actually do something with the information the teacher has provided. It is the doing that in all cases causes the brain to recycle the information in multiple ways, causing the information to be embedded in more parts of the brain. The results of greater retention of information shown on the Learning Pyramid track perfectly with the theory of brain-based learning. 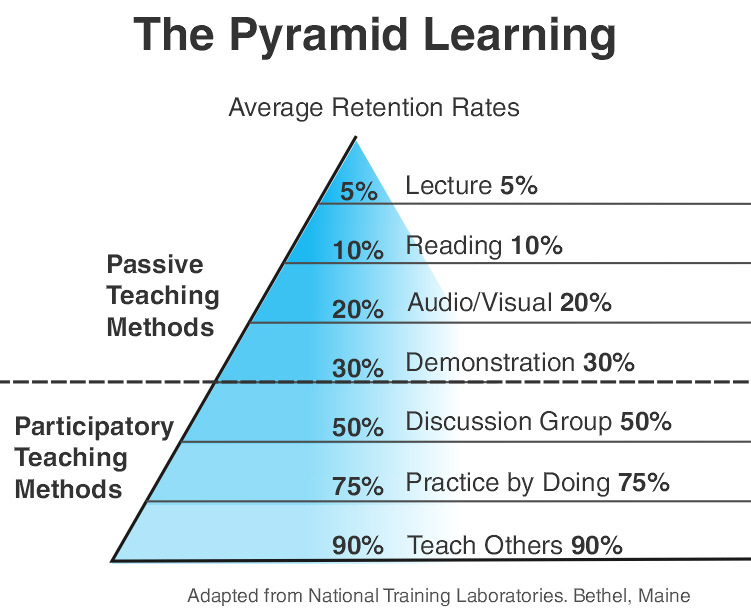 What have we learned from looking at the Learning Pyramid? I think the greatest insight is that what makes sense intuitively on the learning pyramid tracks perfectly with the hard data coming from the scientific community of neurophysiology and other areas of brain-based learning science. Bottom line: Using participatory teaching methods to get your students involved in participatory learning is a winning proposition. For more information about brain-based learning and teaching you can contact me at drjasonstanley@gmail.com. I look forward to your questions.